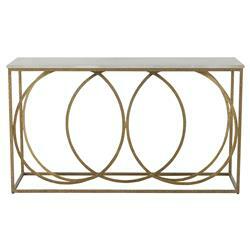 Overlapping gold circles on the open metal frame create a distinctive style using symmetry and geometry. The white marble tabletop exudes classic elegance and makes a lovely surface for displaying photos and mementos for all to enjoy. The antique brass finish is rustic and subtle, so it blends well with a range of other colors and finishes.